Join the Orfeo & Majnun Project and become a workshop leader. 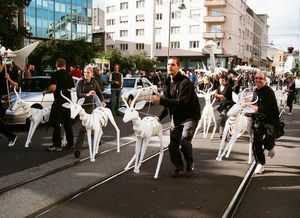 Participate in an Animal Building workshop and be part of a large-scale parade in October 2018! The workshop will be led by designer Vero Schürr, who will be assisted by Gregory Abbott. 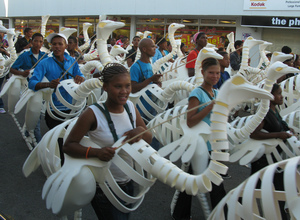 Participants will be required for animal building and also for movement training. 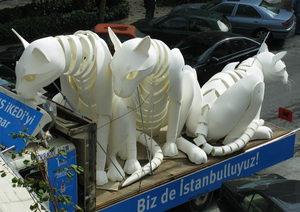 They will be taught how to build polyethylene animals which will be used for the Orfeo & Majnun parade. Participants will get the necessary skills to deliver this training and create these animals with various communities across Malta and Gozo. People attending these workshops will not be remunerated, however they will be remunerated for sessions they will eventually lead with communities in the months following the workshop. Tuesday 13th March – Friday 16th March AND Monday 19th March – Thursday 22nd March at the Catholic Institute, Floriana. Sessions will be taking place on the dates above between 10:00 – 17:00 with a break at 13.00. A given person can be available for less days, up to a minimum of 2 consecutive days. However, it would be beneficial to attend as many days as possible. Deadline for application: Friday 9th March, noon. Anyone can participate as long as they are interested and willing. However participants should ideally have some experience with teaching the public. They will eventually be working with people who have no previous knowledge about building or bricolage. Patience, an eye for detail, the ability to motivate and pass on enthusiasm, and understanding of how their work fits within the bigger picture of the event and some previous experience in building architectural models or props / previous experience in moving objects (not their own body as in the case of dancers). If you’re interested in applying, kindly fill in this Google form. In case of any queries, feel free to send an email to [email protected]. Below find some examples of previous animals / creatures created for Orfeo & Majnun, check out what you can help create! Visit https://www.orfeoandmajnun.eu for more information.